Someone left a comment that they though Ninja Kitty was a girl.HE is not pleased. This strip is a reply to Ninja Kitty!!! 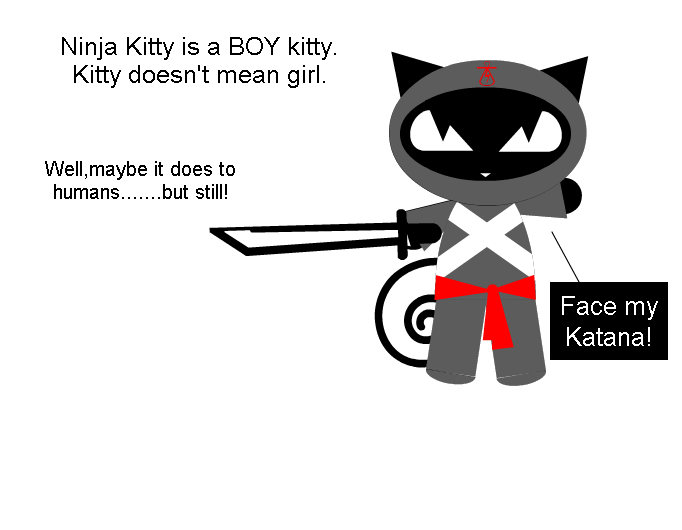 Ninja Kitty is a BOY kitty. Kitty doesn't mean girl. Well,maybe it does to humans.......but still! "Face my katana"this is what I told my gf last night ! AHAHAHAHAHAHAHHAHAHAHAHAHAHAhA !!!!! Well I sure didn't say he was a she. it moves by stealth--it kills without warning--it knows the ancient arts of homicide--it is NINJA KITTEH!!! !